Remember the Kugel Quandary I had recently? Well, in case you were not yet confused about kugel, here we go. Honestly, I am highly uncertain about posting this recipe as a kugel. It’s a cake, really. But when it comes down to it, a sweet kugel (such as this one) is really nothing but a great excuse to eat dessert halfway through your meal. And how can anyone not like that? To avoid confusion, I am going to call this a cake, going forward. Call it a sailboat if you want. The important thing is that you make it and thoroughly enjoy it. Is it really that good, you ask yourself? Make it and see for yourself. And if you are concerned that a cake that can be responsible for a holiday’s worth of happiness is difficult to make, think again. This is wondrously simple. Preheat oven to 350. Lightly grease a 9×13 inch baking pan. Peel and dice apples. Toss with some cinnamon. Spread 1/3 of the crumb mixture on the bottom of the prepared baking pan. Arrange apples on top of the crumbs. Spread another third of the crumbs over the apple mixture. Pour the cherry pie filling over the crumbs in the pan. This can be a bit tricky, as the filling is sticky and slightly hard to spread. I find that it spreads best when placed in small globs across the pan, then gently spread over the entire thing. Spread remaining crumbs over the cherry pie filling. Note that none of the crumb layers will be very thick. Bake at 350 for 50-60 minutes. Thanks for being a part of our apple blog hop! I love crumb cakes and yours looks absolutely divine. 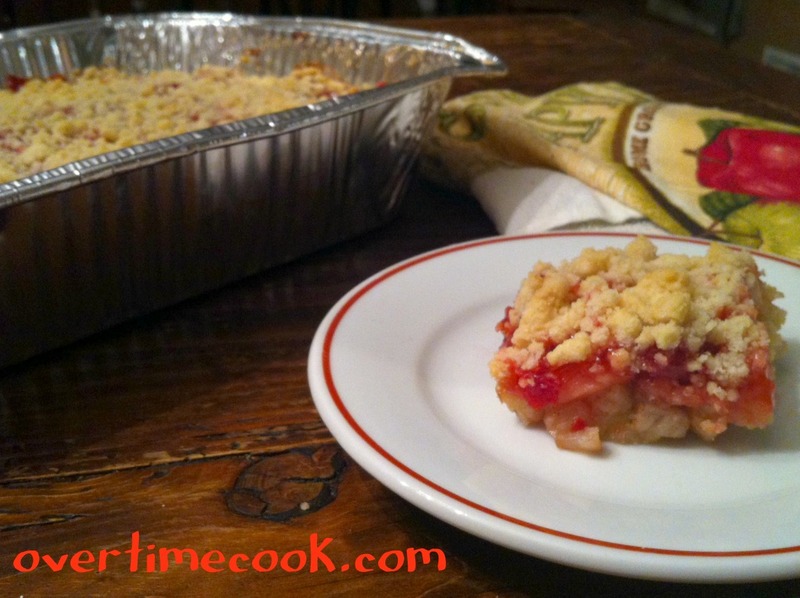 apple cherry crumb cake – what a delish combo! 🙂 welcome to our #applelove bloghop! I really enjoyed this post. Love that your lovely *cake* brightened up the holiday for your then, hospitalized Dad. So sweet. Look delicious I love this! OMG, this looks amazing, but the story about your Dad was awesome.. really tugged at the heart…and now you have this delicious, family tradition ‘cake/kugel’ 🙂 This is why cooking/baking is LOVE. Totally food is prepared with love !! Otherwise it doesn’t taste good !! I just know my family will love this recipe !! Thank u :)! I love Kugel but have never had it with fruit it in, yum! I have a similar recipe, with only the cherry filling, that I love. I tried this one, and that additional layer adds so much. It’s delicious. Wish the canned cherries had a healthier alternative. Too much sugar and food dyes!! Thank you so much,for the alternative suggestion.to the canned cherries. Have a sweet year! Hey, I have made many apple kugels over the years, this one was especially good! Thanks! You can use granny smith apples for a more tart flavor, or any baking apple you like! I made this on Thursday for Shabbos and it was delicious, but by Shabbos day the crumb topping had become soggy. How can I prevent this in the future? Thanks! Where do u use the cinnamon, mixed with the apples or on top? What a beautiful story, and the recipe sounds GREAT! Do you have any idea if this kugel is still good after freezing? Temperature and serve it that way? Thank you! Has anyone tried this with 1/4 less sugar? Think it’ll be sweet enough? I haven’t tried it that way, but I would guess it would work. I took a chance and it came out sweet enough. The cherry pie filling is very sweet so that adds to the sweetness of the whole cake. Thanks! Great recipe it was a hit!